The outdoor leg press is a great, low impact exercise machine with minimal resistance perfect for retirement communities, rehabilitation centers or senior citizen neighborhoods. The leg extension exercise allows users to isolate glutes, hamstrings, quads, and thighs without putting too much pressure on the knees and ankles. Strengthens gluteals/rear, quadriceps/front of thighs, and calves. Provides ideal support to correctly position the knee for minimal pressure. Enhances knee joint stability and functionality with hip extension. Helpful in rehabilitating ACL/MCL tears or other knee injuries. 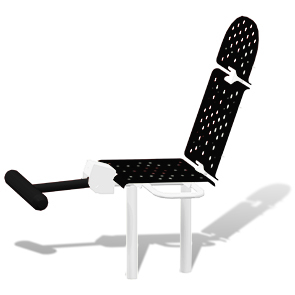 Leg Extension: Sit on seat with back flat against backrest. Place feet under foot holders. Slowly straighten legs. Hold then slowly return to start position. Do not lock knees. The state of the art finishing process used on the Leg Extension Machine combines the application of an 'Electrocoat Zinc Rich Primer' with a durable polyester powder-coat top layer to ensure every crevice and joint is completely sealed, providing full protection against	corrosion and weathering. Leg Extension Machines are finished in either a gloss or textured polyester powder-coat finish.